Today, I display the second of the ‘Pink’ series. Yesterday I explained that Willem de Kooning’s work, Pink Angels, inspired me. This painting was a mix of pink body parts strewn on a mustard-yellow background. The pink shapes that I used were also body parts, but instead of being the violently torn-apart appendages of women, mine were parts of my brother Michael. Mike is my older brother who is very low functioning, autistic and nonverbal. I spent a good deal of my life (and the first year of this blog documenting my efforts) trying to figure out what our relationship was. When I was photographing Mike, I used techniques I learned from many different photographers to capture his image in different ways. I learned a lot about him and myself from those pictures. I am trying to do the same thing by looking through the lens of different painters’ eyes. I am now realizing that biographical information is important to consider when looking at the paintings of these artists. It gives one a better appreciation of the environment within which visual masterpieces were created. 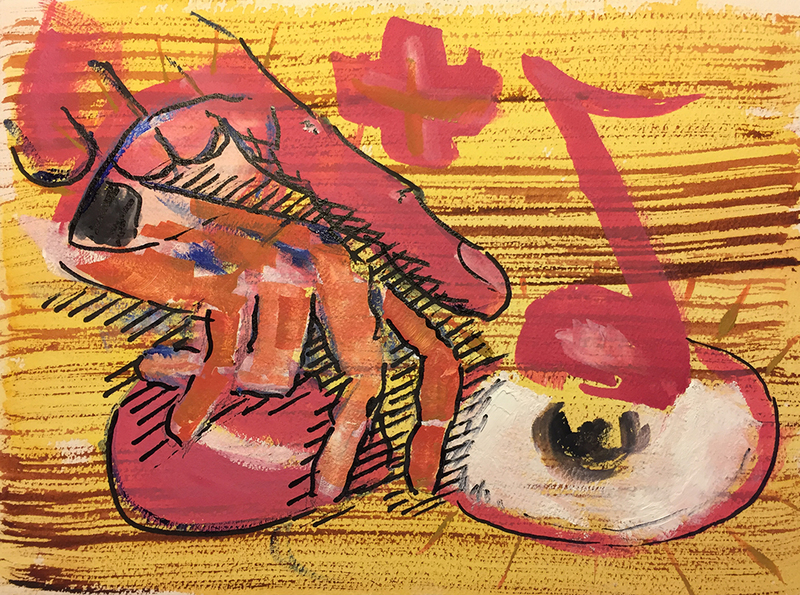 This entry was posted in Personal Stories and tagged abstract art, artistic process, autism, autism siblings, creative process, creativity, Pink Angels, visual arts, watercolor, Willem de Kooning. Bookmark the permalink. Extra wow for this one. Thank you, Claudia. It’s hard to know how these fantasies come across. Jack, I’m impressed with how far you’ve come with your art and your analytical ability to discover where you are going with your own palette. Thank you, Sheri! Very kind of you to say. Ever onward, with any luck.